GE Capital’s sales incentive program, The Platinum Club, rewards sales executives who achieve their sales goals. The company invests heavily to show these key executives that they are appreciated (one of the perks is a trip to Adair Manor in Ireland), and needed an invite package worthy of the valued group. Snowball worked with event management firm USMotivation to design the invite package. We established a theme for the event, offering them “the key to the castle” for their hard work and success. The package included an old-fashioned key to reinforce the theme. 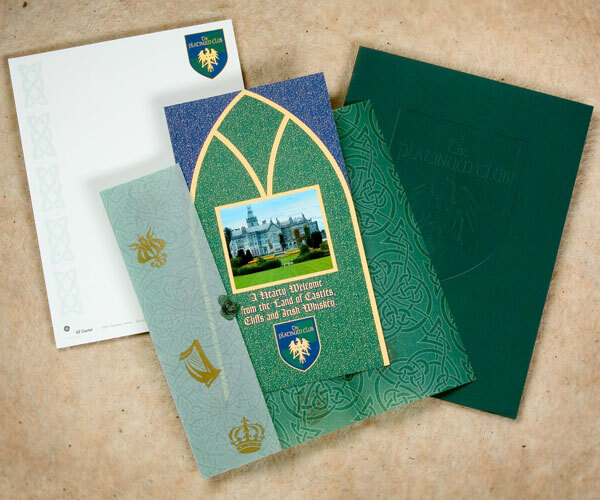 Using a less expensive two-color process, we printed blue and green on yellow paper to create a rich color scheme for the brochure and wrapped it in translucent parchment, printed with hand-illustrated Celtic designs and finished with a wax drip seal on the outside. GE Capital had an elegant, sophisticated package to share with its top sales performers. The Adair Manor brochure expressed management’s appreciation and reinforced its investment in the incentive program.